Proserve Cranes Ltd supply and install numerous lines of electric overhead travelling cranes, electric hoists and other lifting equipment and accessories from top manufacturers such as Kito, SWF Krantechnik, Street, CM, Yale, Demag, Kone and Verlinde. We also manufacture and install fixed and mobile A frame gantry cranes and custom monorail systems and specialist lifting attachments. 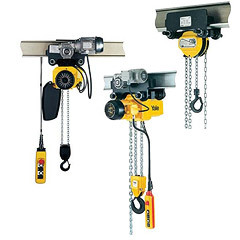 We stock hooks and chains and can manufacture and repair custom chain slings. Our crane parts department can supply original parts for most makes and models of cranes, hoists and other lifting equipment. The crane inspection department can perform required six monthly inspections on and annual inspections and services on electric hoists, gantry cranes and jib cranes with all relevant provided on hard copy and retrievable by customers online. All inspection, service and repair data is entered into the Proserve Cranes Online Equipment Database. 24/7 access to this database is available to our customers. With a proven track record of top level service from a highly qualified, dedicated and experienced team of technicians, Proserve Cranes is ready to be your one stop shop for product sales, service, parts, inspections, certification and training. We offer a prompt, efficient to help get your equipment back working as quickly as possible. Talk to our department about our inspection and service contracts designed to save you money and downtime. © Copyright 2010 - Proserve Cranes. All rights reserved.